There comes a time when we all realise we need to go on something of a health kick. When we’ve over indulged or treated ourselves a little bit too much we realise it is time to get our acts together and make some positive changes to our lifestyle. The best way to do so is to start exercising and eating healthily. Of course eating healthily is not always easy, especially when it comes to snacking! When hunger pangs hit, you may be tempted to reach for the nearest chocolate bar or packet of crisps. But these soda crackers are a great alternative. They’re healthy and tasty and best of all they’re completely gluten free. Having a gluten intolerance and trying to eat healthily can be difficult. You’re already trying to deal with the allergy and what you can and can’t eat without having to consider a whole new set of rules at the same time. These gluten free soda crackers aregreat for snacking on the go and make it easy for you to eat healthily and look after your figure. They’re also really easy to make and you can make a batch and take them to work so you won’t be tempted to pop to the sweet shop during the day! To begin preheat your over to 200 degrees C, gas mark 6. Take a large bowl and sift the gluten free flour into it. Then do the same with the salt and the baking soda. Add the butter tot he bowl and blend until the butter is combined with the dry mixture and broken down. This may take some time but keep at it! Next add the milk and egg to the mixture. Combine the ingredients until they take on a stiff doughy consistency. Wash your hands thoroughly and they kneed the dough for some time. This is important for getting the dough soft and lump free. Once you have done this roll the dough out using a rolling pin until it is thin. Using a pastry cutter cut the dough into whatever shapes you want. Place the dough cut-outs on a buttered pastry sheet on a baking tray. Prick each of them with a fork and place the tray in the oven. 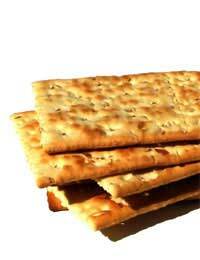 Bake the crackers for around 10 minutes. Once cooked take the tray out of the oven. Sprinkle the cracker with sea salt and leave to cool. Store the crackers in an air tight container once they have cooled. They will go soft and stale if you don't. For a bit of fun why not make the crackers in interesting shapes like stars or flowers. This is a great way to get kids to enjoy the crackers as opposed to fat-packed crisps or other snacks. They're so easy to make you can even let the kids help too! Hi, I've been looking for a gluten-free soda cracker recipe to use in those refrigerator desserts where you layer the crackers with pudding and whipped cream and sometimes fruit. Would this recipe work for that or would the crackers turn to mush? Also, is the flour blend supposed to contain xanthan gum or not?